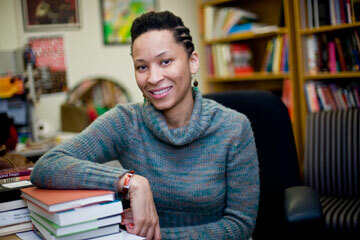 The Department of African American Studies in the College of Arts and Sciences will present the Third Annual John L. Johnson Lecture, featuring Marlo D. David, associate professor of English and women’s, gender, and sexuality at Purdue University, on Monday, Feb. 20, from 5 to 7 p.m. in the Peter Graham Scholarly Commons, Room 114, E.S. Bird Library. The event will draw on the rich legacies of Black women’s cultural contributions and consider the ways that the cultural work of black women and girls will be critical to our collective abilities to resist the new politics of Trumpism. Dr. David’s scholarship has focused on contemporary African-American cultural studies as well as feminist gender and sexuality studies. Her interdisciplinary research traces the ways black writers, artists, and performers respond to inter- and intra-racial representations of blackness and contemporary American politics in the post-Civil Rights era. Her work offers ways of interpreting African-American literature, performance, and popular culture that emphasize the multiplicities of black identities and challenge stereotypes that stigmatize black people, particularly black women and girls. She teaches courses on black women writers, motherhood in American literature, black gender and sexuality studies, black feminism, African-American satire, postmodern black cultural studies, and feminist theory and methodology. Dr. David is the author of Mama’s Gun: Black Maternal Figures and the Politics of Transgression, which identifies five bold, new archetypes of black motherhood for the post-civil rights generation in order to imagine new ways of thinking about pervasive maternal stereotypes of black women. Rather than avoiding “negative” images of black motherhood, such as welfare queens, teen mothers, and “baby mamas,” Mama’s Gun centralizes these dispossessed figures and renames them as the Young Mother, the Blues Mama, the Surrogate, Big Mama, and the Mothership. The John L. Johnson Lecture is named for Syracuse’s first director of African American studies. Supported by a fund established by his friends and family members, the lecture series seeks to bring a prominent African American teacher-scholar to campus each spring. Between 1966 and 1971, Johnson was a visible figure at Syracuse, spearheading the establishment of what would become the AAS department, serving as an assistant provost for minority group affairs, investigating the “Syracuse 8” football boycott, teaching in the School of Education and founding the King-on-Campus (nee Croton-on-Campus) program between the University and the Syracuse City School District. He left the University in 1971 to become associate superintendent of schools for specialized education in Washington, D.C. The lecture is free and open to the public. The talk will be followed by a Q&A session, light refreshments and a book signing.